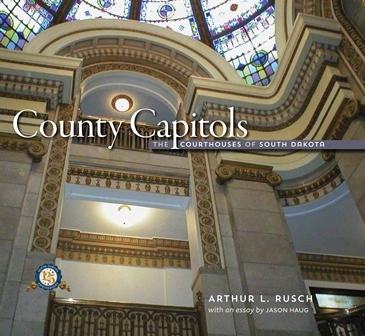 “County Capitols: The Courthouses of South Dakota” by former circuit court judge Arthur L. Rusch, will be released at the South Dakota Festival of Books on Friday, Sept. 26, in Sioux Falls. Rusch’s book details the history and architecture of the state’s current justice buildings and is the fifth volume in the Historic Preservation Series from the South Dakota State Historical Society. Dreaming of great things for their communities, the pioneer town-builders who settled southern Dakota Territory took extreme measures to ensure that their communities would become commercial and industrial centers. One way to secure the survival of a town was to acquire the county seat. Using county records, period newspapers and other resources, Rusch shows how the “courthouse fights” between rival communities turned into outright battles, including bidding wars and midnight forays to steal county records and even buildings. In an opening essay, Jason Haug outlines the development of these county capitols and their architectural styles over time. Rusch, of Vermillion, received his undergraduate and law degrees from the University of South Dakota and served as a judge in South Dakota’s First Judicial Circuit for 17 years. An avid local historian, he has given numerous presentations and won awards for his work. More information about Rusch’s participation in the South Dakota Festival of Books can be found by contacting the event’s sponsor, the South Dakota Humanities Council, at (605) 688-6113, or by visiting www.sdbookfestival.com. Haug worked for the State Historical Society’s Historic Preservation Office at the Cultural Heritage Center in Pierre for eight years, serving as director from 2007-2012. He currently lives in Willmar, Minn.
“County Capitols” will be available for $29.95 plus shipping and tax and may be purchased from most bookstores or ordered directly from the SDSHS Press. Visit www.sdshspress.com, email orders@sdshspress.com or call (605) 773-6009.